Since I started at 7digital I’ve loved our belief in continuous improvement. Throughout our history as a company we have had a number of influential women working in various parts of organisation yet I knew there was more we could do to improve the diversity of our tech team. When I joined in July 2014 I was one of two women on the tech team, a position that was short-lived as my fellow female dev left for a new position, leaving me with the coveted position of “the woman developer”. Not wanting to sit idly by and maintain my new title I set about pro-actively working with others in the tech team to grow our outreach to female developers. After only a year and a half, our tech team is now made up of 23% women, of which a number hold senior developer positions. The first part of the hiring process is centred on the job advert so we felt this was an important place to start. A key step for us was to re-evaluate the language we used so that we could strive to incorporate gender-neutral terminology1. Using the online tool Textio, which has used machine learning to detect gender bias from millions of successful (and less successful) job advertisements, we were able to achieve this. It is useful to know that there is more to consider than just the use of pronouns when influencing or encouraging balanced applications. As a team we’ve benefitted from understanding how tone and structure in writing can impact your communication from a gender perspective. Here at 7digital we believe it is important to not only strive to attract the best talent but to also help nurture it ourselves. Every year we give internal team members from any department, as well as two new graduate hires, the opportunity to take part in our Technical Academy. The programme consists of 6 months of software development training covering everything from writing code to build automation. Our graduate hires are taken on as full time developers, which ensures that from day one they are fully immersed into our tech teams. The academy originally began as a way to teach inexperienced software devs specialised skills. The programme has since expanded to include staff who wish to become software developers or simply to gain skills that will support their current role at 7digital. The Technical Academy has received increasing interest from female employees outside the tech team as well as a rising number of women for the graduate positions. Whilst selection for the academy has not focused specifically on women, we found this to be one of the most successful factors in increasing our gender diversity. We hope that other companies see the same success with established internal training programmes. Creating and implementing a code of conduct for our events was a no-brainer, and one of the simplest changes to implement. We used an open source code of conduct and made sure attendees at our tech meetup, Devs in the Ditch, were aware of the standards of behaviour expected. Whilst we have not had any poor behaviour in the past, we recognised the importance of having a clear code of conduct, one that ensures attendees of any gender or background are treated with respect. This allows us, as hosts, to outline the culture of our events, and handle situations in the event that a guest’s behaviour falls below the standards expected. The single most important thing we did turned out to be free and easy: to educate our teams and create an open-environment for gender issues. When the women in our company spoke about the issues they have faced, we as a team listened. We discussed how men and women write their CVs differently and to be aware of the tendency for women to undersell themselves2,3. We raised awareness of ways that all of our team could be encouraged to contribute to discussions and not feel that they were being ignored – for example, asking people to think before interrupting someone and reducing the use of gendered pronouns. This worked especially well with the female team members as they were no longer frustrated that they had to make extra effort to get their opinions heard. Jenny, a senior developer in the Delivery Team, spoke to us about how the company should provide employees with a clear route to progress. We even had an, unfortunately failed, attempt at a women’s football team. The importance of this has been that by listening we have then been able to implement change! It is great to get your own house in order, but we also recognised the importance of getting involved with external organisations and discussions that help encourage gender diversity in technology. As a company, we have increased our support for organisations such as Stemettes, CAS #include and Geekettes: CAS #include works with teachers to ensure the new computing curriculum is an equal opportunity for everyone; Stemettes encourages girls to choose STEM based subjects by running hack days; Geekettes is a global organisation that encourages the advancement of women in tech or digital leadership roles. Our efforts have included ten members of our team attending the #include computing wikibook hackathon, as well as being a part of their role model poster project – with 7digital tech team designing and starring in the poster. 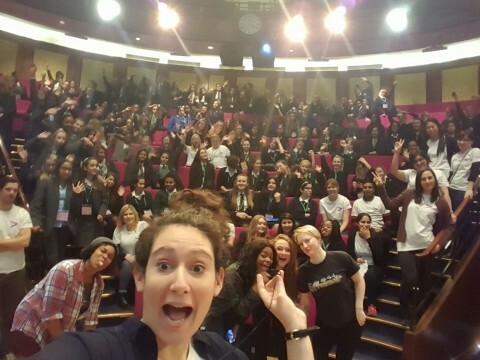 We’ve also sent volunteers to help support the Stemettes recent Code Warriors Hackathon, which lead to the hashtag #GirlsinSTEM trending for 8 hours on Twitter! We found the issues discussed at these events were discussed within the office, which has help to spread both awareness and knowledge. What have 7digital said about this? Janey, one of our newest apprentice developers, noticed the positive gender ratios on the tech team and told us after joining it was a deciding factor in accepting a role here. For us this validated the effort and time spent on the things we listed above as we could see the value from having more women in the team was attracting more women. She also told us in her interview she is going to be a CTO one day, and we hope to help her on her way with that. In an industry which is 16% women, we have been pro-actively striving to support the presence of female role models. We have been looking at the way progress works within 7digital and have held a tech team open space, making sure we had women there to provide feedback. We know there is still a lot of work to do but we didn’t want to wait to share what we did. Whoever you are, man or woman, if you are into software development or system administration and want to join us on our journey of continuous improvement, we are hiring and would love to hear from you!